Location: Coastal Peak Park, Newport Coast. From the 73 toll road, take the MacArthur exit (the last one that’s free). Merge onto MacArthur, go 2.3 miles and turn left on San Joaquin Hills Road. Go 2.5 miles, turn right onto Ridge Park Road and drive 1.8 miles to the end, and access the trail from Coastal Peak Park. From P.C.H., take Newport Coast Drive north for 2.4 miles, turn right on Ridge Park Road and drive 1.5 miles to Coastal Peak Park. 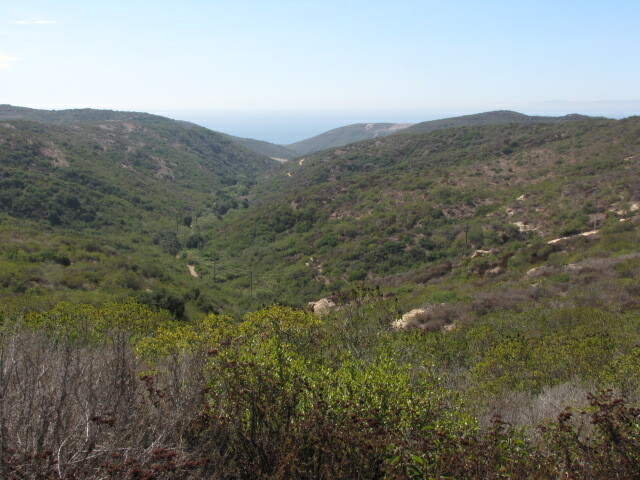 This trip is like a longer and more challenging version of the Elevator/Slow’n’Easy loop, traveling through both Laguna Coast Wilderness Park and Crystal Cove State Park. Unfortunately, the lower end of Emerald Canyon is closed as of this writing due to trail damage, but the loop still serves as an intense workout with some panoramic views of the ocean, the Santa Ana Mountains and more. 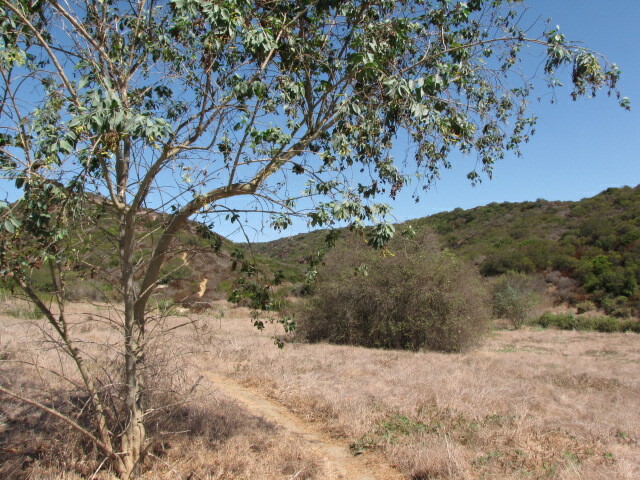 The route leaves from the Coastal Peak trailhead in the northeastern corner of Laguna Coast Wilderness Park. It follows Bommer Ridge Road for two miles, through several ups and downs. On the left (north), the views of Old Saddleback and the Santa Ana Mountains are great, especially when the weather is clear. Head right on the Old Emerald Falls trail, which emerges from the woods and enters a meadow. As you cross the meadow, you may notice a steep fire-break that begs the question, “The trail doesn’t really do that, does it?” Yes, it does. For the next mile and a half, the trail ascends steeply, finally meeting the Moro Ridge fire road. Bear right and continue climbing to a junction with the Missing Link trail. You can continue on the Moro trail to Bommer Ridge, head left and return to the starting point, but to make things more interesting, try heading left. The Missing Link trail, single-track, parallels Bommer Ridge, with nice views down into Emerald Canyon. The Missing Link trail crosses the Slow’n’Easy trail, where its name changes to Fenceline (after the fence dividing Crystal Cove State Park and Laguna Coast Wilderness Park.) When the Fenceline Trail reaches the Deer Canyon Trail, head right to rejoin Bommer Ridge. Head left and retrace your steps to the Coastal Peak trailhead. Text and photography copyright 2011 by David W. Lockeretz, all rights reserved. Information and opinions provided are kept current to the best of the author’s ability. All readers hike at their own risk, and should be aware of the possible dangers of hiking, walking and other outdoor activities. By reading this, you agree not to hold the author or publisher of the content on this web site responsible for any injuries or inconveniences that may result from hiking on this trail. Check the informational links provided for up to date trail condition information. Sounds good – I’m not sure the next time I’ll be in the area but I’ll let you know.